Chen Su Lan Methodist Children’s Home (CSLMCH) is celebrating its 50 years of providing Care, Shelter and Love to children and youth whose families have difficulties in providing them with a safe and nurturing environment this year. 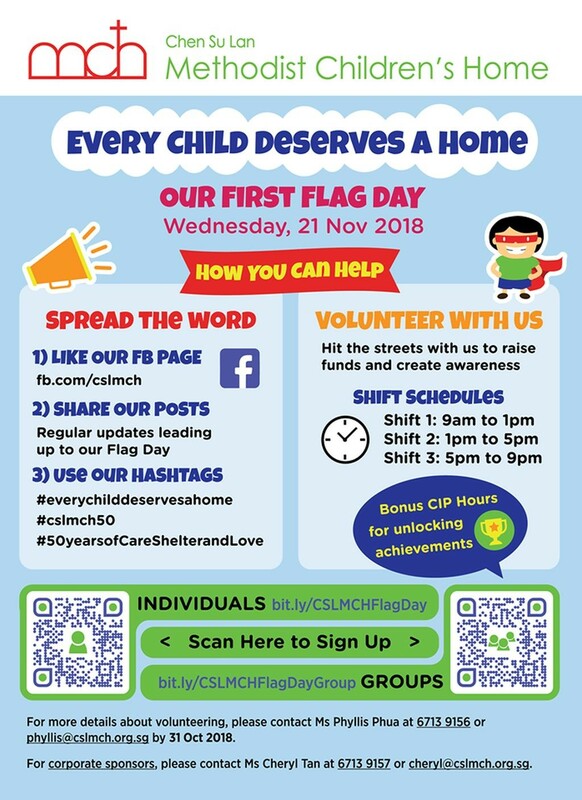 It would like to invite you to be a part of its very first flag day to help raise funds to support the healing and nurturing of every child to their fullest potential and creating awareness about CSLMCH. Show your support for the cause by signing up to be a volunteer, pledging a donation, giving or sharing with others about this event. Every effort you put in makes a difference in the lives of the children at CSLMCH! For more information about volunteering, please contact Ms Phyllis Phua at +65 67139156 or phyllis@cslmch.org.sg by 31 Oct 2018. For corporate sponsors, please contact Ms Cheryl Tan at +65 67139157 or cheryl@cslmch.org.sg. For other information about CSLMCH, please visit www.cslmch.org.sg and facebook.com/cslmch, watch video, email info@cslmch.org.sg or call +65 67139150. Chen Su Lan Methodist Children’s Home is a shelter home for boys and girls from needy, broken, dysfunctional or abusive families in Singapore. We provide them with shelter, care and protection; we try to heal and develop them; and we try to reunify them back into their families.